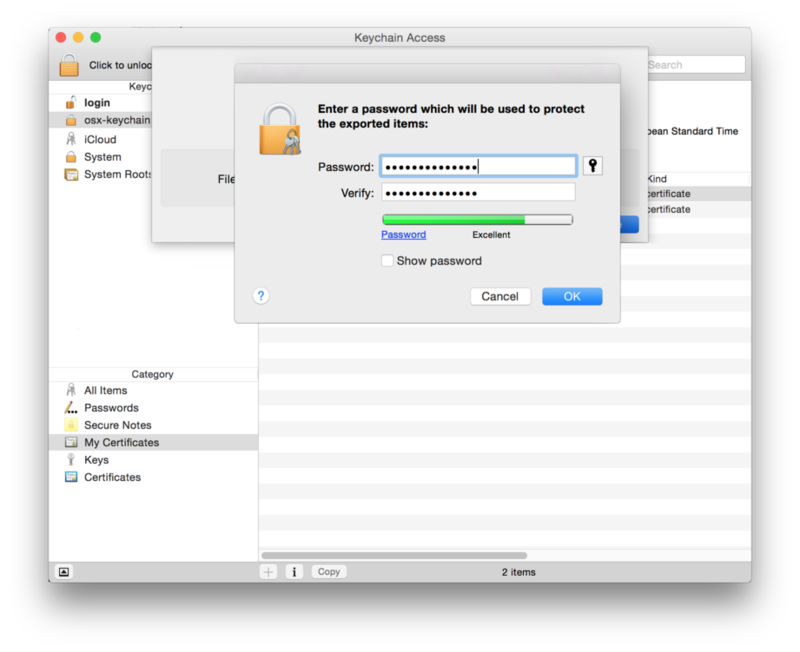 Starting with OS X 10.8, Apple has tightened its security policies through the inclusion of "Gatekeeper". This new feature is intended to protect users from malicious software by only allowing applications from the Apple Store or signed by a registered Apple Developer to be installed. This security policy (the default one) can be relaxed to allow any application to be installed but the process is not straightforward and most users are not willing to do that. Even though OS X has made it mandatory to sign your installers, InstallBuilder offers a way to make this process easy. The first step in the process is to become a registered Apple Developer and request a signing certificate. You can follow the steps to request and install your certificates in the Apple Documentation: developer.apple.com/library/mac/. After installing your certificate, you can proceed to integrate it into the build process. InstallBuilder supports two modes of signing OS X installers. When building on OS X, if you provide the <osxSigningIdentity> setting, the builder will try to use the installed codesign tool in the system. If you are building on a different platform, or the builder fails to validate the provided signing identity, it will check if <osxSigningPkcs12File> is provided, and use the built in signing mechanism, not dependent on installed tools, if it is. As as summary, on OS X, <osxSigningIdentity> takes precedence over <osxSigningPkcs12File>, and is completely ignored in other supported platforms (Windows and Linux). When providing the <osxSigningPkcs12File> setting, InstallBuilder will use its multiplatorm built-in signing mechanism. The advantage of this mode of operation is that it allows building and signing your OS X installers in any of the supported platforms: Linux, OS X and Windows. You could even combine it with the Native codesign Mode so the builder will use it on OS X and fallback to the built-in mode on the rest of platforms. When building, the builder will prompt you to enter the password to unlock the PKCS#12 file, and sign the installer. You could also provide the password through the <osxSigningPkcs12Password> tag. The builder will then use the value instead of asking you to enter the password interactively. If then you try to build without defining the variable, the builder will simply ask for it. The first step will be to locate your signing certificate on the Keychain Access application. 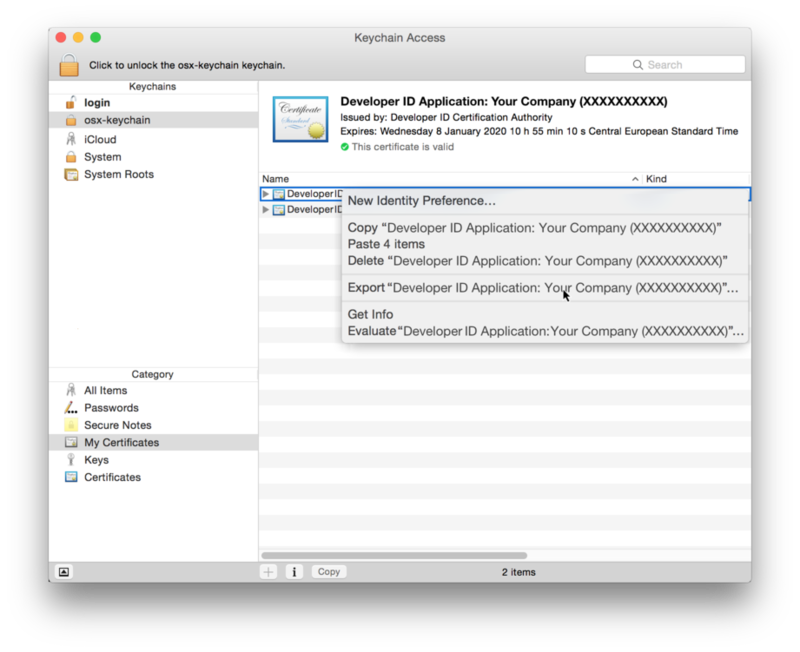 If you did not create a separated keychain for it, it will be typically located in your login keychain. The certificate to export should be named similar to Developer ID Application: Your Company (XXXXXXXXXX), where the string between the parentheses will be your Team ID. You may also have another certificate named Developer ID Installer: Your Company (XXXXXXXXXX) but we are not interested in that one. This mode of signing is only supported on OS X and requires a working codesign installation (with usually requires a modern Xcode plus the command line tools add-on). As this method calls codesign internally, it has the advantage of being able to adapt to future changes in the signature format by Apple (if those changes do not affect how the tool should be called). 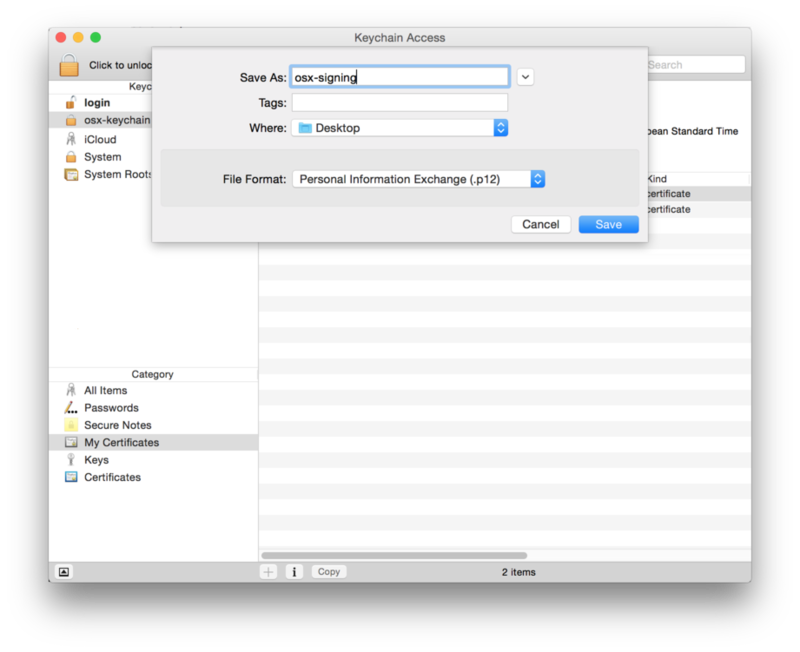 This is the recommended method if you are building on OS X. <osxSigningIdentity>: This is the "Common Name" of your Apple Developer certificate. It is usually called Developer ID Application: Name of Your Company. The signing process is enabled by completing this field and is the only one truly mandatory. <osxApplicationBundleIdentifier>: The unique identifier of the application, formatted in reverse-DNS format. It is not required to be customized to allow the singing of your application but InstallBuilder uses the same one for all generated installers (com.bitrock.appinstaller) so you should provide one that matches your company name and application. For example, if your company domain name is example.com, and your application is named "Foo Bar Editor", you should use com.example.foo-bar-editor. This identifier can be also registered using the Developer Certificate Utility. You can now launch the build process and the builder will try to sign the installer (please note that this process is only allowed on OS X). If your keychain requires a password to access your keys, you will get a dialog requesting it. After introducing it, the build process will continue. The signing of the bundle will be performed after copying the file so that the signature won’t be broken. Warning: Error signing installer: sample-1.0-osx-installer.app: User interaction is not allowed. The OS X codesign tool is required for the signing so the signing process is only allowed on OS X.
InstallBuilder is also able to sign Windows installers provided with a PKCS#12 or PFX file containing your signing certificate and keys. Windows, Linux and OS X build platforms are currently supported so you are not longer forced to use Windows to integrate the build and signing of your installers. InstallBuilder uses OSSLsigncode tool to sign Windows installers. The tool can be found in the installation directory, in the tools folder. While regular use of the builder GUI and CLI modes will not cause the target binary to be signed.